We all know cricket is a gentlemen’s game and it has now become the most famous sports watched worldwide. If we talk about India, after Bollywood, we get entertained by cricket. People love to watch cricket and it has become an important source of entertainment. We are all aware of the fact that our Indian team plays with passion for our country and they all love to play for the nation. One such example is M S Dhoni. In the history, he is the most amazing Indian Cricket team captain. In recent times, you must have seen that his helmet doesn’t have any National flag. People show the love for their country in various manners. For a cricketer, it is printing of the national flag on their helmet. When M S Dhoni wore a helmet without the national flag, it was something that got his fans surprised. He is one of the most respected and lovable player. It was under his captaincy that India won the world cup after a long time in 2011. But the missing flag on the helmet has left his fans curious and they wanted to know the reason for the Helmet not having the national flag. There are many answers which are coming up, but the most rational reason for this might be that M S Dhoni is also a part of the Indian National Army. We all know his love towards the army as he has updated a lot of pictures wearing the Indian Army uniform. According to the Prevention of Insult to National Honor act 1971, Explanation 4 includes, allowing the National flag to touch the floor or ground or trail in water intentionally, it is a disrespect of the Indian National Flag. Being a wicketkeeper, M S Dhoni has to keep his helmet to keep on the ground. So, as he knows the code of conduct of the Indian National Flag which doesn’t allow the national flag to be kept on the ground, he was left with 2 options. He had the option of either putting the helmet with the National Flag on the ground or keeping the helmet without the National flag on the ground. Being the nation’s favorite player, he has to maintain the code of conduct as a cricketer as well as an Army Officer. He has become ideal for a number of people who follow him. He doesn’t want any bad impression by keeping the National flag on the ground. 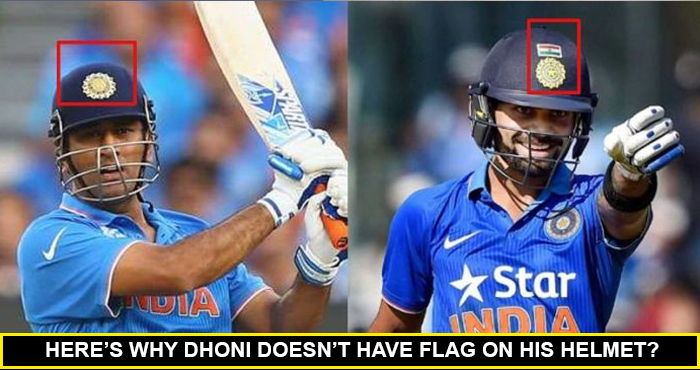 Although this is a theory given by a fan, seems to be the perfect reason for Dhoni not to put the national flag on this helmet. We all have loved Dhoni for a number of reasons and if this is true, then one more reason is added to the list to love him.